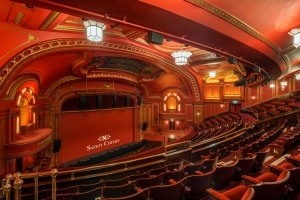 At the end of the 12 year reign of We Will Rock You we had the opportunity to escalate the refurbishment and restoration programme of this Grade II listed theatre. 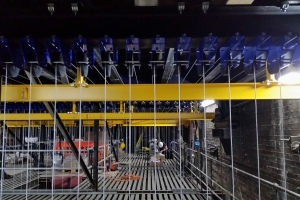 After an intense three and half month multi-million pound project, the Dominion Theatre reopened as one of the most technologically advanced theatres in the West End. The Flying System – One of the key elements to a functional stage house making sure scene changes happen smoothly and without interruption. The new 56 bar counterweight system and runway beam system has the ability to hold over 40 tonnes of weight. This was by far the largest singular installation in the refurbishment programme and has given us the ability to house any production. Front of House – After the terrific response we received after the opening of the Premiere Bar, we decided to replicate the style throughout all the bar areas. We also finished the refurbishment of all toilets in the theatre adding in extra cubicles where feasible, to help reduce waiting times. 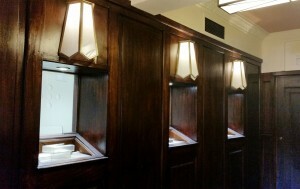 Electrics – All light fittings throughout the theatre were replaced using replica fittings, where possible. 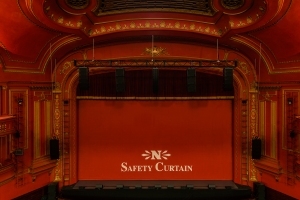 During the space of 14 weeks, we replaced the majority of all the electrical cable throughout the theatre future proofing the Dominion and providing productions with a “plug and play” infrastructure. 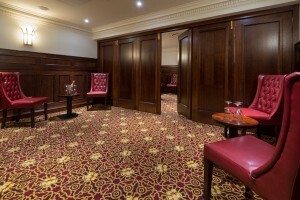 The Royal Rooms – An area known as The Royal Variety Bar, until about 6 years ago, had more recently been used for storage. This area has been completely renovated to become two luxurious, spacious hospitality suites with private entrances, toilets and bar/catering areas allowing you to upgrade your theatre experience to one you will never forget. This space also has the added bonus of becoming one large function room. The Proscenium Arch – At over 80ft, this was one of the largest challenges in the project with over 170 man hours of painting and restoration. The gold detailing is one of the theatre's original features and all damage to the beautifully crafted plasterwork has been lovingly restored. The Auditorium – Last fully refurbished in 1991, a surface area of 5225m2 of fibrous plaster was surveyed, repaired and redecorated. The list of works inside is endless but includes new carpets, reupholstering of all the seats, new lighting fixtures, new handrails and restoring 4 previously boarded up arches with newly crafted plaster work enhancing the theatre’s stunning 1920s art deco features. Orchestra Pit – We took a large portion of time reinstating the Orchestra Pit. The pit was last used in 2001 for Beauty and the Beast. Since then it had been filled with electrics and cages as part of a show. After a long wait, it had not only been restored but enlarged giving us the opportunity to house a 21 piece orchestra making this a very exciting feature of the theatre. Reinstating the pit rail was a big task, using the remains of the previous one; we recreated the wooden rail that divides the band and the audience. This is a stunning addition to the auditorium. Main Foyer – Once the Freddie Mercury statue and shimmer curtain were removed from the front elevation we re-instated the windows which were hidden behind; bringing natural light into our foyer and The Studio. From cleaning the marble on the walls, plaster repairs, painting, re-carpeting and French polishing, not a single part of the Dominion’s grand entrance was left untouched. 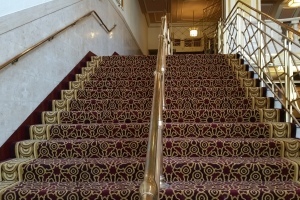 The Carpet – This bespoke carpet was over 2 years in the making and designed with a focus on the theatre's features; each curve and line carefully selected from details found in the plaster, wood and metal work throughout the theatre. For example, the rose the carpet can be found on doors, metalwork, around the main foyer, auditorium ceiling and proscenium arch. 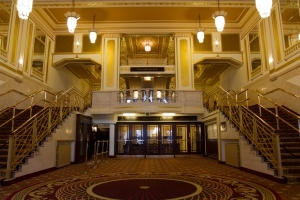 Box Office – It is incredibly rare to have an opportunity to refurbish a box office as they rarely close - remaining open during the refurbishment, they relocated to Nederlander House allowing ticket sales to continue. The box office was completely redesigned internally and fully refurbished externally for the first time in almost 30 years. The Front Elevation – Through cleaning and stone repair, the theatre’s facade has received a much-needed revival after years of pollution and discolouring. 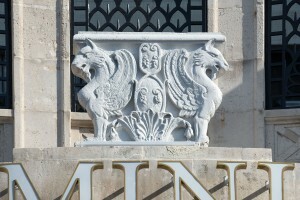 Potentially one of the most exciting restoration projects of its history is the reinstatement of a huge ornate stone depicting two gryphons which was once positioned above the windows. It is believed it was removed in 1932 to make way for the musical ‘Silver Wings’ when an aeroplane was placed on the front. The stone had been sat inside a protective casing on the roof ever since. Keep in touch with us for news on future restoration projects!